For the Dungeons and Dragons monster, see Pedipalp (Dungeons & Dragons). Pedipalps (commonly shortened to palps or palpi) are the second pair of appendages of chelicerates – a group of arthropods including spiders, scorpions, horseshoe crabs, and sea spiders. The pedipalps are lateral to the chelicerae ("jaws") and anterior to the first pair of walking legs. Pedipalps are composed of six segments or articles: the coxae, a single trochanter, the femur, a short patella, the tibia, and the tarsus. In spiders the coxae frequently have extensions called maxillae or gnathobases, which function as mouth parts with or without some contribution from the coxae of the anterior legs. The limbs themselves may be simple tactile organs outwardly resembling the legs, as in spiders, or chelate weapons (pincers) of great size, as in the scorpions. Comparative studies of pedipalpal morphology may suggest that leg-like pedipalps are primitive in arachnids. At present, the only reasonable alternative to this view[according to whom?] is to assume that Xiphosurans reflect the morphology of the primitive arachnid pedipalp and to conclude that this appendage is primitively chelate. Pedipalps are traditionally thought to be homologous with mandibles in crustaceans and insects, although more recent studies (e.g. using Hox genes) suggest they are probably homologous with the crustacean second antennae. Chelate or sub-chelate (pincer-like) pedipalps are found in several arachnid groups (Ricinulei, Thelyphonida, scorpions and pseudoscorpions) but the chelae in most of these groups may not be homologous with those found in Xiphosura. The pedipalps are distinctly raptorial (i.e., modified for seizing prey) in the Amblypygi, Thelyphonida, Schizomida, and some Opiliones belonging to the laniatorid group. Pedipalps of spiders have the same segmentation as the legs, but the tarsus is undivided, and the pretarsus has no lateral claws. Pedipalps contain sensitive chemical detectors and function as taste and smell organs, supplementing those on the legs. 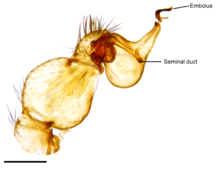 In sexually mature male spiders, the final segment of the pedipalp, the tarsus, develops a complicated structure (sometimes called the palpal bulb or palpal organ) that is used to transfer sperm to the female seminal receptacles during mating. The details of this structure vary considerably between different groups of spiders and are useful for identifying species. The cymbium is a spoon-shaped structure located at the end of the spider pedipalp that supports the palpal organ. The cymbium may also be used as a stridulatory organ in spider courtship. The embolus is a narrow whip-like or leaf-like extension of the palpal bulb. ^ a b Comstock, John Henry (1920) [First published 1912]. The Spider Book. Doubleday, Page & Company. pp. 106–121. ^ Foelix, Rainer F. (1996). Biology of Spiders (2 ed.). Oxford University Press. pp. 182–185. ^ "Seismic signal production in a wolf spider: parallel versus serial multi-component signals", Journal of Experimental Biology. Savory, T. 1977. Arachnida. 2nd edition. U.S. Edition published by Academic Press INC. LTD.340 pp. Snodgrass, R. E. 1971. A Textbook Arthropod Anatomy. Published by Hafner Publishing Company, INC. 363 pp. Torre-Bueno, J. R. 1989. The Torre-Bueno Glossary of Entomology compiled by Stephen W. Nichols; including Supplement A by George S. Tulloch. Published by The New York Entomological Society in cooperation with the American Museum of Natural History. 840 pp.